ARISTOTLE. The Works. Translated by Thomas Taylor. London, Printed for the Translator, 1807-1812. 9 volumes + 2 supplementary volumes: 11 volumes in total. FIRST EDITION IN ENGLISH OF THE COMPLETE WORKS. ONE OF ONLY 50 COPIES; signed by Taylor at the end of vols. 1 and 4. Contemporary full calf; handsomely rebacked. The present set is not only the first publication of Aristotle’s complete works in English, but also proper First Editions in English of most of the texts contained herein – and specifically, of all of Aristotle’s scientific works. Only a few of Aristotle’s “easier” works – intended for a more general public: e.g. the Ethics, Politics, Rhetoric, and Poetics — were translated previously to this edition. Taylor’s translations are distinguished not only for their accuracy and fidelity to the text, but also for the additional excerpts they include from the best of the early Aristotelean commentators. 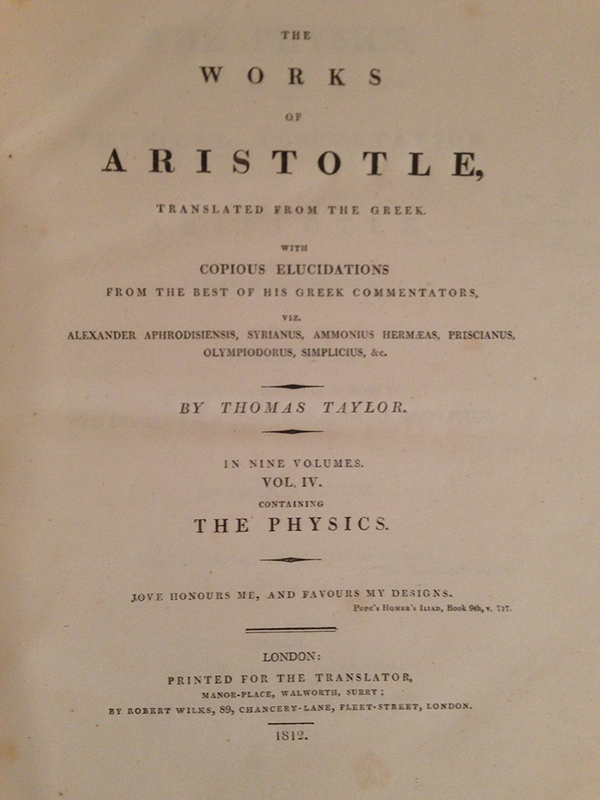 Though the publication of this collected Aristotle was funded by Taylor’s patron, William Meredith, the distribution of the work was entirely at Taylor’s sole discretion and prerogative. Almost all sets of the work were in fact “presentation copies” – Taylor gifting them as he deemed appropriate. 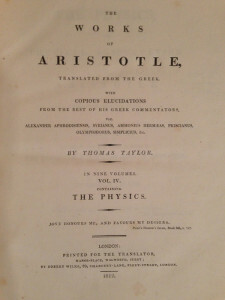 Taylor typically presented his Aristotle in 11 volumes – as here: 9 volumes of the Works proper plus his separately published Dissertation on the Philosophy of Aristotle (1804) and the first edition (1801) of his translation of the Metaphysics. Inherently rare, the set is lacking in many major libraries. Thomas Taylor was a translator of epic proportions. He is, for example, the only man in history to translate all of Plato and Aristotle. Even more significantly, Taylor single-handedly revived the Platonic Philosophy from the deep slumber it had fallen into at the beginning of the Industrial Revolution – Taylor translating virtually all the major works of the Neoplatonic corpus in the prosecution of his monumental purpose (and many minor texts as well). Taylor, in conformity with the great Neoplatonists, saw a harmony between Plato’s and Aristotle’s thought, and accordingly he deemed it proper to also translate Aristotle as part of his greater mission. Though the established academic circles of the time tended to disparage Taylor’s efforts, his work resonated with the English Romantic Poets and American Transcendentalists … and his reputation has only grown greater over the years.